Need a Dryer Vent Cleaning? It’s Gotta be Reliable. A clogged dryer vent can be more than an inconvenience to drying clothes—it can be a fire hazard to your home. In fact, clothes dryers are the leading cause of house fires in the US. That’s why it’s important to get your dryer ducts cleaned at least once a year. At Reliable Heating & Air, we’ll safely clean every inch of your dryer vent, giving you the most reliable dryer vent cleaning service in Atlanta. Contact us online or call us at (770) 594-9969 to schedule an appointment. We'll call you to confirm your time and send you a confirmation email with a picture of your tech, so you know who's coming to your home. First, your tech will inspect your dryer duct to make sure it’s in good condition and can handle a cleaning. Then, they’ll safely and effectively clean all of the lint, dust and debris from your dryer duct. 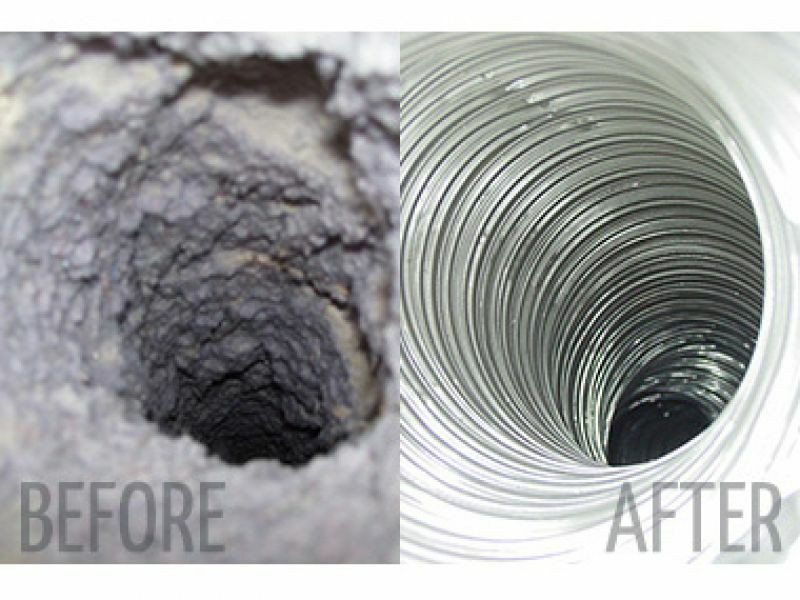 Not completely satisfied with our dryer vent cleaning service? Let us know in our follow-up survey. We’ll do everything we can to make it right. Your dryer, clothes or laundry room feel hotter than normal. When the vent is clogged with lint, the dryer isn’t getting proper ventilation. Since that excess heat can’t escape through the vent, it sits in the dryer, forcing your unit to overheat. Lint overflowing from the outside vent opening. This is a sign that your dryer duct is filled with lint and will soon clog if it hasn’t already. Clothes take too long to dry or smell musty after a cycle. Your clothes should be dry after one dryer cycle. If they’re not, the vent is clogged or there’s a problem with your dryer. A spike in utility bills rise (without an increase in electricity usage). A dryer with a clogged vent will have to run longer to dry clothes. And longer drying times mean higher electricity bills. You haven’t had the vent cleaned in over a year. We recommend getting your dryer vent cleaned at least once a year to prevent the issues we mentioned above. Improve dryer performance. A clogged dryer vent will limit how much air and moisture is removed from your clothes, making your dryer run longer than necessary. Plus, the excess wear and tear on the unit means more frequent repairs. Reduce energy bills. Because a dryer duct cleaning will improve dryer performance and cut down on drying time, you can expect to pay less in utility bills. Prevent house fires. Dryer lint is extremely flammable. And when lint clogs your dryer, the unit overheats, significantly increasing the chances of a fire. Cleaning your lint filter after every dryer cycle. Your dryer duct is designed remove the lint that the filter doesn’t catch. When the lint filter is full and can’t catch anymore lint, the amount of lint going into the dryer vent will increase and make it clog quicker than normal. Checking the vent flap when your dryer is running. Located outside, the dryer vent flap keeps objects (vermin, bird’s nests, etc.) from entering your dryer duct. But the flap can sometimes get stuck, which will prevent air from escaping when the dryer is running and cause it to overheat. Check the flap every few months to make sure it’s working properly. Getting annual dryer duct cleanings. The best thing you can do to prevent a clogged vent is to get it cleaned annually. A dryer vent cleaning service will remove all the lint, dirt and debris in your duct, preventing buildup that causes clogs.